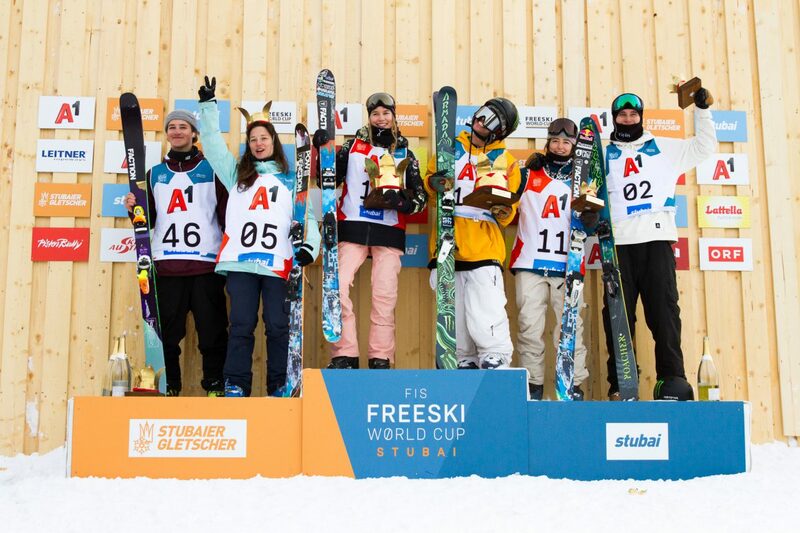 E-Dollo topped the men's podium at the first major slopestyle event of the season. 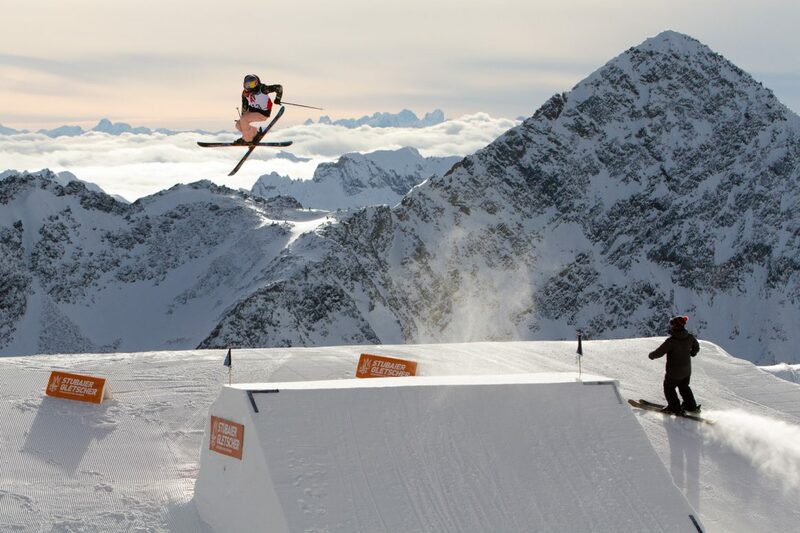 Henrik Harlaut and Kelly Sildaru took the win at yesterday’s World Cup Slopestyle on the Stubai Glacier in Tyrol, Austria to kick off the 2018/19 World Cup Circuit. 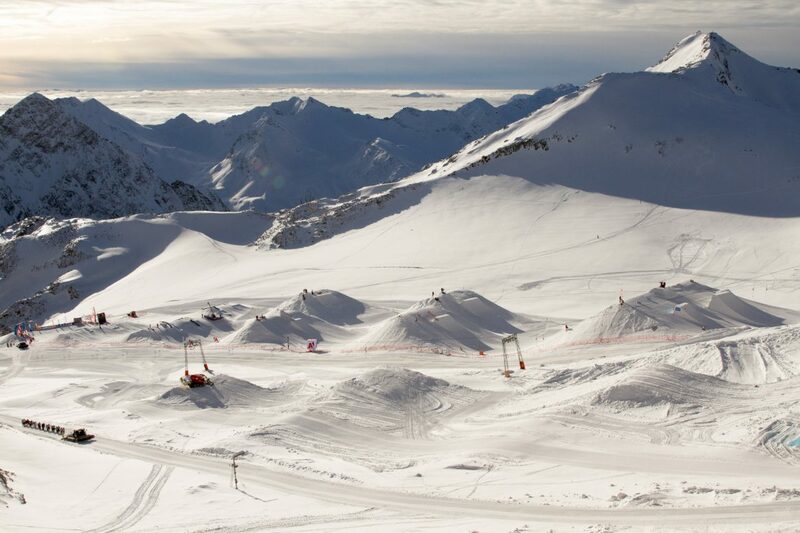 The south-facing slopes of the Stubai Zoo terrain park are a dream come true for the snowpark crowd. Canada's Patrick Dew was one of the fresh faces in finals this year. With a storm brewing over the weekend, event organizers sped up the schedule, packing both men’s and women’s qualifiers in on Thursday, followed by finals on Friday. 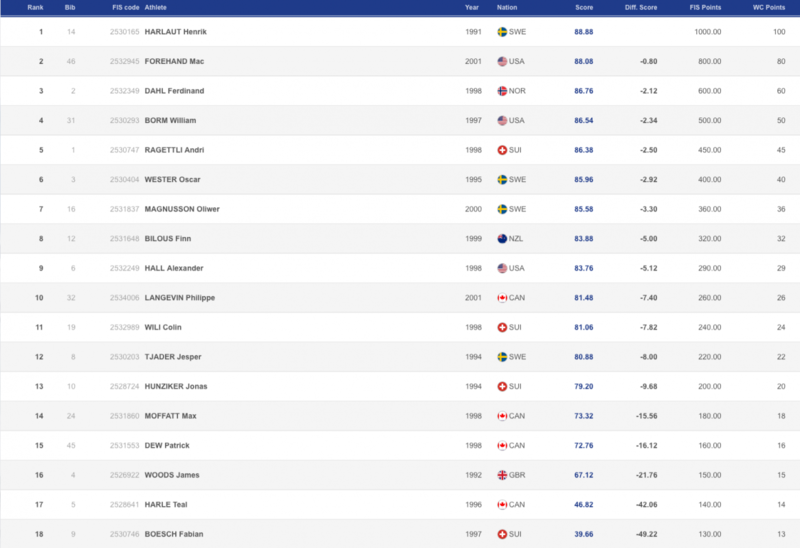 A stacked field of men and women advanced from the qualis, with Kelly Sildaru leading the women’s field with a staggering score of 97.00, and Willie Borm, Jesper Tjäder and Oscar Wester winning their respective men’s qualifying heats. 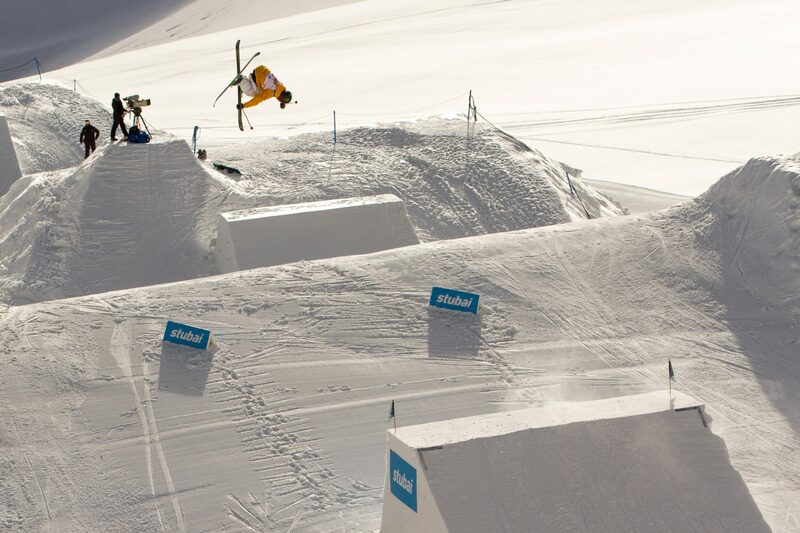 Colin Wili, one of four Swiss riders to make the finals, tees off on the cannon wallride feature. On Friday, an oversized finals heat of 18 men and 8 women took to the slopestyle course for two more runs under fine conditions, with a blanket of clouds coating the vista to the south and the peaks of the Italian Dolomites lining the horizon. In the women’s field, Americans Maggie Voisin and Julia Krass both came out swinging with double corks (Voisin with a double 10 and 12, and Krass with a double 7), but both were unable to land clean runs. The heavy-hitting Swiss trio of Giulia Tanno, Mathilde Gremaud and Sarah Hoefflin held back on their doubles in this early-season contest, clearing the way for young Estonian phenom Kelly Sildaru to once again claim the top spot with back-to-back left and right switch 1080s, and a rail game (switch 2 on, pretzel 6 out on the cannon wall, front swap 270 out on a down rail, and a 270 pretzel 270 on the last rail) light-years ahead of her competition. Kelly Sildaru's back-to-back switch 1080s were impressive, but her talent really shone in the rail section, where she was way ahead of the competition. On the men’s side, a stacked field contended for podium placement, with the Swiss, Canadian and Swedish teams looking favored with four men each in the finals. 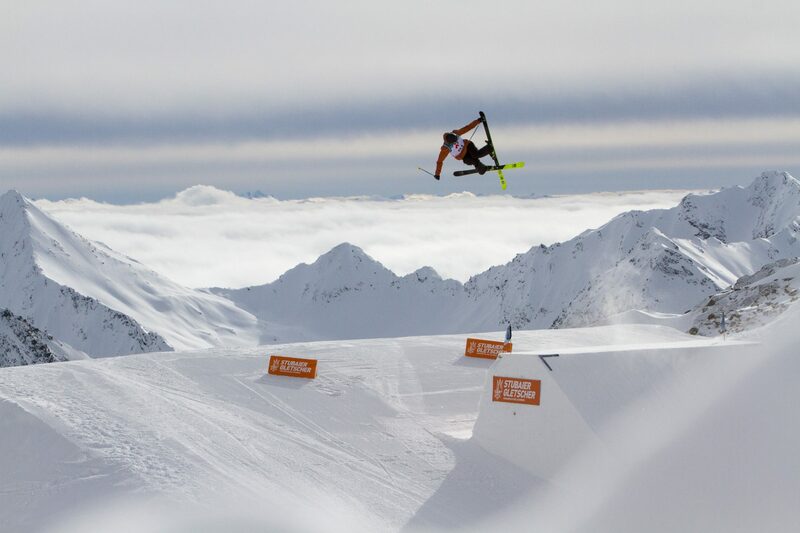 Canada’s Teal Harle was looking for the podium with a switch triple cork—the only skier besides Harlaut to unpack a triple in finals on the relatively modest jumps of this course—and a huge disaster 630 in the rail section, but couldn’t hold things down to complete a run. 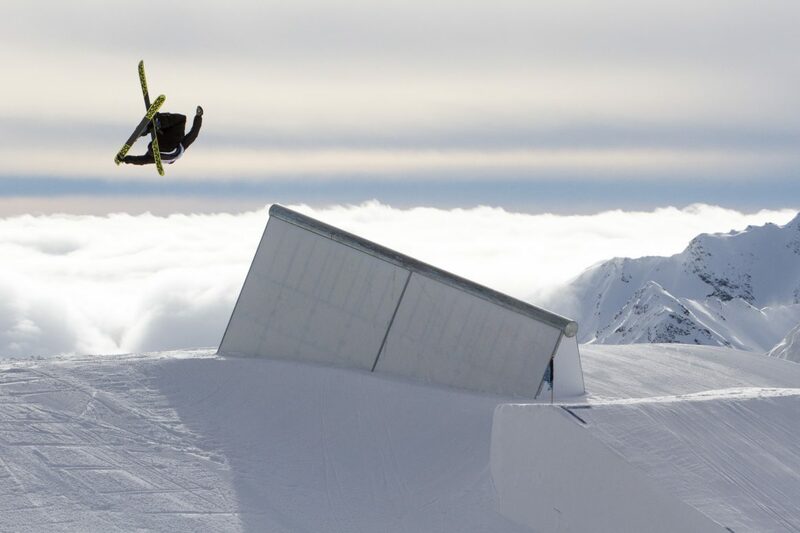 Switzerland's Fabian Bösch was a favorite, but took a tumble on the cannon rail feature on his first finals run and ended up with a concussion instead of a podium place. 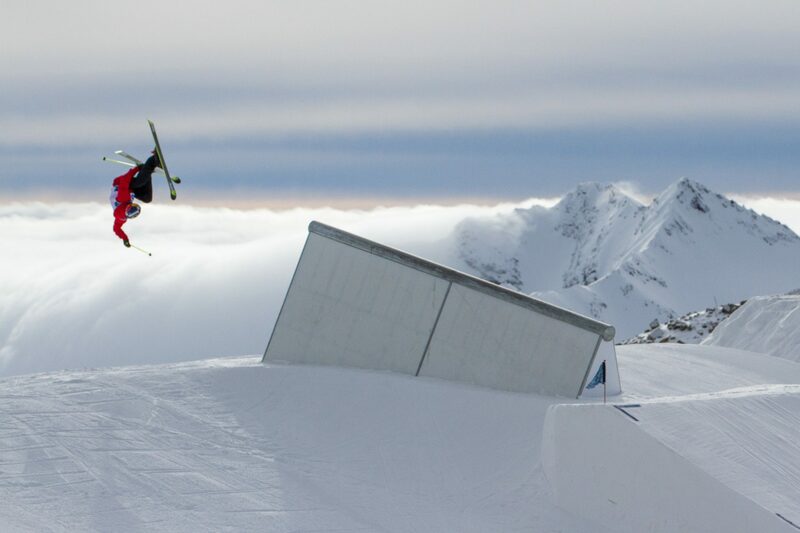 In the end, Harlaut’s score of 88.88 was good enough for the win: his signature switch “orbital” triple 12 mute on the first jump, followed by a rightside double 12 safety and a classic E-Dollo performance in the rail section. He was trailed by American up-and-comer Mac Forehand, all of 17 years young, who impressed the judges with clean switch and forward 12s in the jumps and a big backside 360 swap, pretzel 2 in the rails, while Norway’s Ferdinand Dahl rolled into third place with flawless execution and a healthy dose of his much-hyped style. Mr. Reliable, Henrik Harlaut wasn't to be stopped. Some notables who missed the podium included out-of-the-box thinker Jesper Tjäder, who impressed with antics like a front flip japan off the cannon rail and a crazy 540 swap over the rail transfer; Swiss heavyweight Andri Ragettli, whose new switch double misty 16 wasn’t enough to carry the judges’ favor; and Canada’s Max Moffatt with a switch double 12 true nose grab that has to be seen to be believed. Yes, that's true nose in a switch double 12. Max Moffatt, you're a beast. Perennial podium contender Andri Ragettli had to settle for fifth place yesterday. 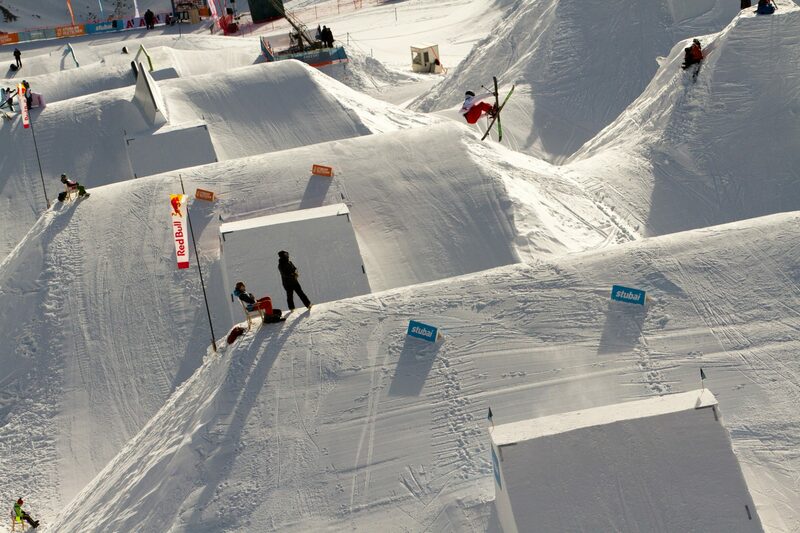 Another highlight was the debut of the new World Cup slopestyle judging format. Taking notes from the snowboarding side, which has been using feature-based judging for years already, the new format for freeskiing breaks down the judging on individual features, with a maximum of 60 points awardable for tricks, and an additional 40 points awarded for overall flow and variety. 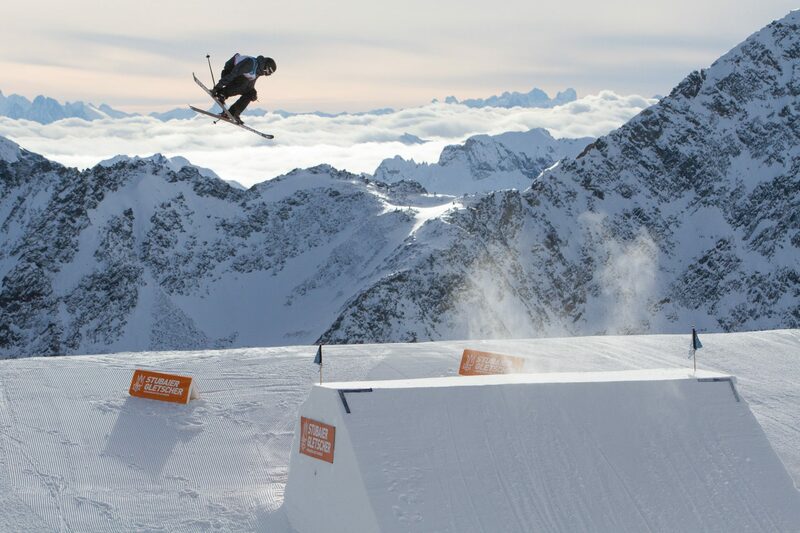 In general, athletes seemed pleased with the new format, which rewards riders for specific huge tricks landed, while still maintaining an eye on the variety of the overall run. The new judging format means individual highlight tricks, like Jesper's front flip off the cannon rail, can be rewarded. 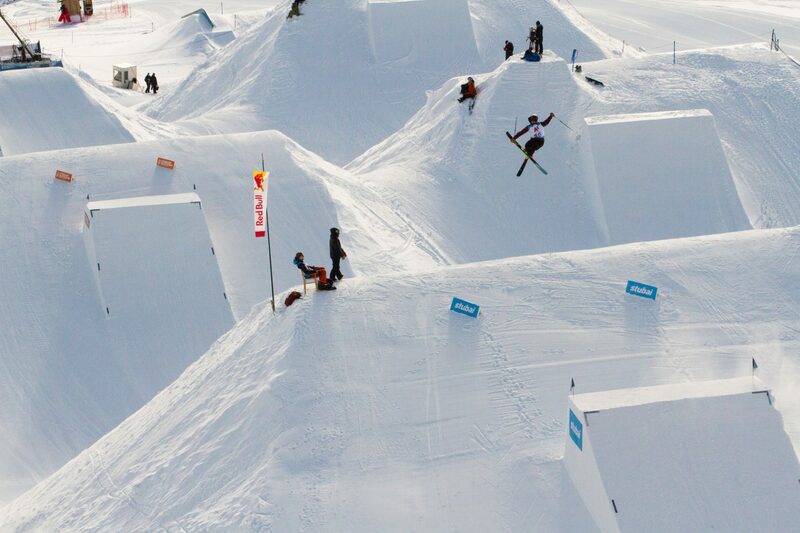 Another notable takeaway from the Stubai slopestyle was the remarkably young field. At age 27, Henrik Harlaut was the oldest competitor on course, with a pack of young guns hot on his heels: 12 of the other 17 finals contestants were 21 years old or younger. The amount of fresh young talent competing at a high level—like Forehand, Sweden’s Oliwer Magnusson or Canada’s Philippe Langevin—indicates that a new generation of freestylers is currently on the come-up. Younger riders like Mac Forehand are poised to make a splash on the contest circuit this season. The combined men's & women's podiums.